I have made my fair share of French fries from scratch. And you know what? This whole time I have been doing it wrong. 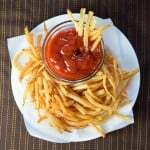 If you have scoured the internet hoping to learn how to make French fries from scratch chances are you will come across a lot of websites preaching the traditional double fry method that requires one long fry at a lower temperature and a second long fry at a higher temperature. This is the long established accepted method, but it is wrong. Why is it wrong? Because it results in dark brown fries that quickly turn limp after a few minutes out of the fryer. If given the choice, most people would rather have a nice crispy pale fry, more reminiscent of McDonalds. Right? Kenji López-Alt over at Serious Eats got his nerd on and whipped up some 43 batches of fries trying to perfect the ideal French fry from scratch and it is seriously an amazing read for food nerds. I’m in awe of his dedication to the perfect fry and I cannot say I’ve ever used calipers in the kitchen. However, luckily for those who don’t really care to read all about pectins, starch and simple sugars, I’m going to lay out his findings for you in a condensed layman’s version. So gather your spuds and let’s make some fries! Thermometer – I wouldn’t even try deep frying anything without a thermometer. Without it you will have no idea what the temperature of oil is and your results will vary wildly. Mandolin – Though a knife will suffice, a mandolin will help ensure perfect cuts and a uniform shape for consistent cooking. What is the best oil for making French fries? Peanut oil, hands down. It has a very high smoke point and it imparts a desirable flavor to the fries at the same time. However if you don’t have peanut oil, any other high smoke point oil such as canola or even plain ol’ vegetable oil will suffice. Peel your potatoes if desired. This is optional. Cut your potatoes into ¼” strips. However I also had success with slightly larger cuts. Using a mandolin makes this easy otherwise it can also be done with a good chef knife. If using a knife pay extra attention to ensure strips are uniform so they cook evenly. Place all cut potatoes in water while you are working. Why? Placing potatoes in water will prevent the oxidation that causes exposed potato surfaces to quickly turn an undesirable black color. Add vinegar, water and potato strips to a pot, cover, and heat to boiling. Boil for 10 minutes. Why vinegar? The acidity of the vinegar holds the potatoes together so they don’t get mushy and fall apart while boiling. Why boil? Boiling is the secret step in my opinion. Boiling not only pre-cooks the interior of the fry so it will be nice and soft when you eat it but more importantly this step is the secret to prevent fries from turning dark brown later in the frying process. Remove the potatoes from the water after 10 minutes and let them dry on paper towels for 5 minutes. Why? You don’t want to set wet potatoes in oil unless you are trying to meet a handsome fireman. While the potatoes are boiling heat oil in a heavy bottomed pan (or deep fryer) to ~400 degrees. Why? You want to fry the potatoes at a temperature of 360 degrees, so by heating up the oil hotter the temperature should drop into the proper range when the fries are added. Once the potatoes are done drying add them to the oil in small batches and fry for 50 seconds, adjusting the heat as needed to maintain 360 degrees. Why? You are trying to blister the exterior of the fry and firm it up after it has been boiled. This will result in a crispier fry later. Place fries in the freezer till frozen. If you want your French fries to be perfectly straight when you are done be sure to freeze them lying straight like matchsticks. Otherwise they will retain whatever twisted position you freeze them in such as you see in my photos. Why? Freezing damages the internal structure of the potatoes so they cook up fluffier on the inside. This step can be optional if you are in a hurry. Though, if you want to continue straight to the next step, you need to at least let them cool first. Heat oil back up to 400 degrees. Why? We are aiming to fry the potatoes at 360 degrees again, so by heating it hotter the temperature should drop in the proper range once fries are added. Working in batches fry the French fries for 3 ½ minutes. Remove from oil earlier if they are turning noticeably brown. Adjust the heat as necessary to maintain 360 degrees. Remove from oil and set on paper towels to soak up oil and salt immediately with a generous dusting of table salt. The French fries can be kept warm in a 200 degree oven while the other batches cook. Well? 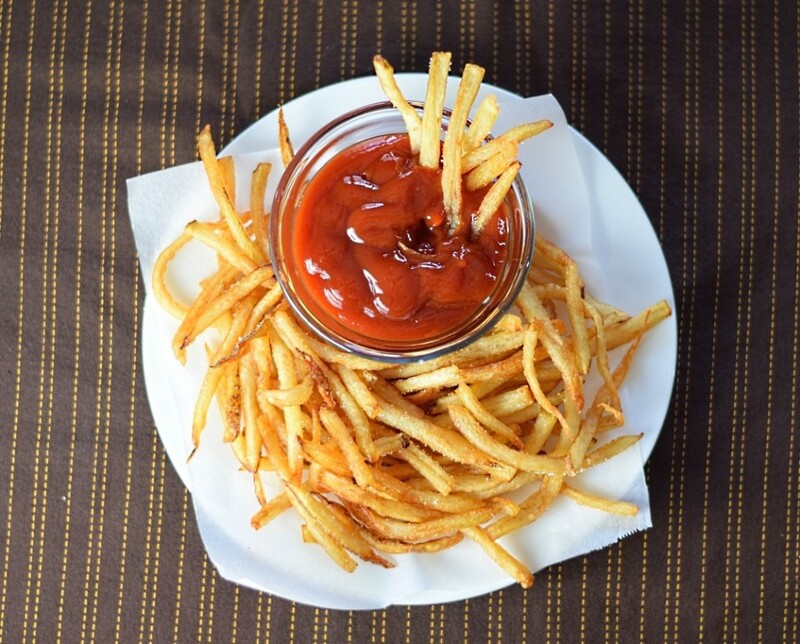 Now that you know how to make French fries from scratch, are you ready to give it a try? Let me know what you think. 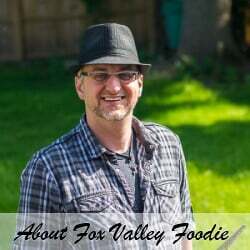 Also be sure to follow me on Facebook and Pinterest to stay on top of all the latest posts from the Fox Valley Foodie! Want to make french fries from scratch but don't like the dark brown soggy fries? This recipe will yield perfectly crisp pale yellow fries that are guaranteed to please. Skin the potato if desired and cut into ¼” strips. Add potato slices, vinegar and water to pot and bring to a boil. Boil for 10 minutes. While potatoes are boiling heat oil around 400 degrees. The ideal frying temperature is 360 so by heating it hotter the oil should drop into the proper range when frying. Once potatoes are done boiling let them sit out and dry on paper towels for 5 minutes to prevent a reaction with the oil. Once dry add the potatoes to the oil and fry for 50 seconds. Try to maintain a temperature near 360 degrees. Remove fries from oil and let cool. (Optional) For a fluffier interior, place fries in a container and set in the freezer overnight, or longer. Working in small batches, place frozen fries in hot oil and try to maintain a frying temperature of 360. Fry for 3 ½ minutes or until they are colored to your liking. 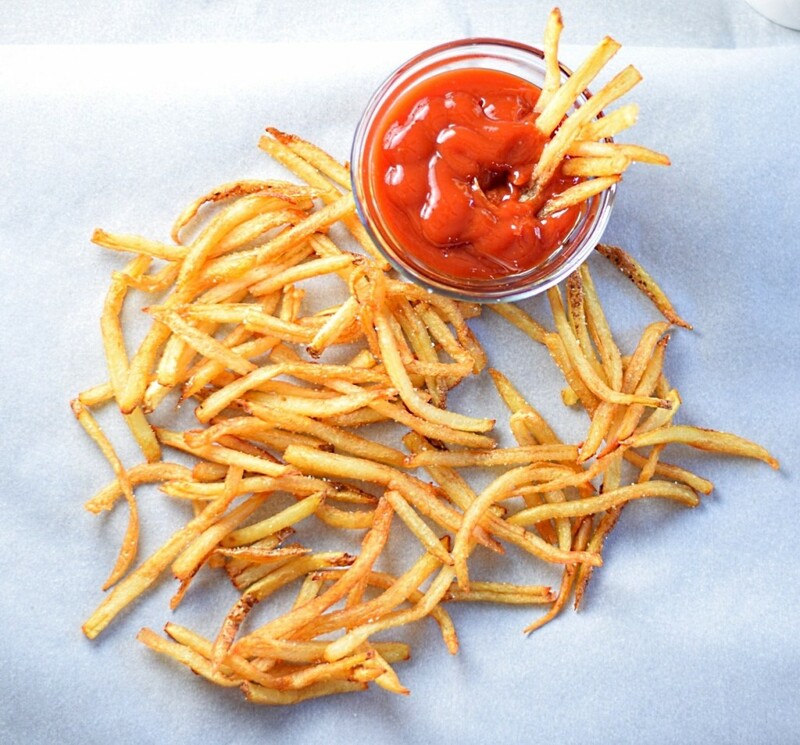 Place fries on paper towels to soak up grease and salt immediately and generously with table salt. Fries can be kept warm in 200 degree oven while remaining fries cook. If you want your French fries to be perfectly straight be sure to freeze them straight. This can be accomplished by rolling them in a paper towel while they lie flat when you are prepping them for the freezer. I made it! it was great but some of them had a bit uncooked inside .